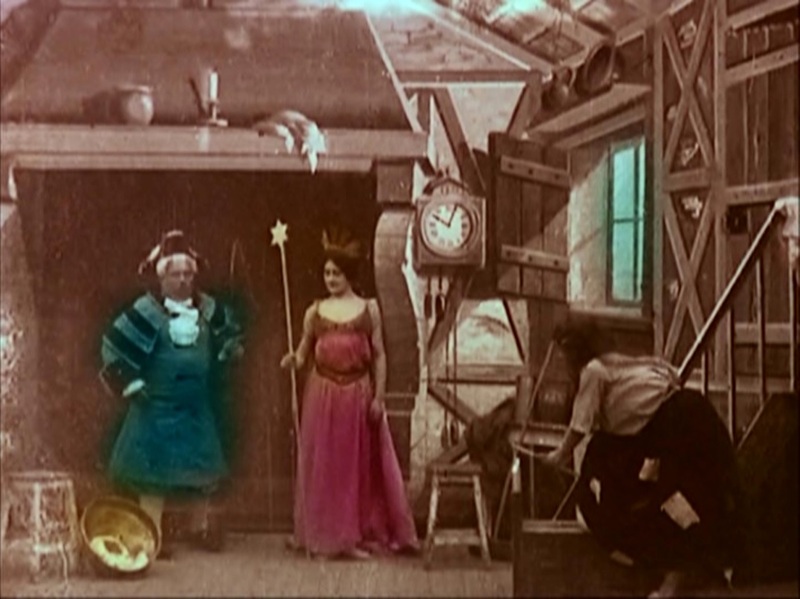 Georges Méliès provides this version of the classic fairy tale in one of his most ambitious nineteenth-century productions. It includes five different camera set-ups and, according to the Star Films Catalog, “thirty five” extras, all on a typically small stage. The movie starts a little abruptly, with Cinderella in the kitchen begging to be allowed to go to the ball, but her step-sisters leave and slam the door in her face. She mopes around a bit and then her fairy godmother appears and turns various household pests into servants for her and a pumpkin into a coach. Then she gives her a gown to wear, and Cinderella climbs into the coach (right there in the kitchen!) and drives off, though the godmother stops her to warn her to be back before midnight. She disappears through a trap door in the floor. 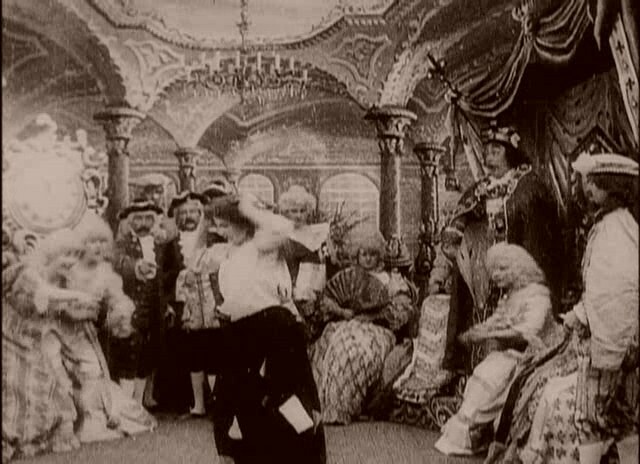 The next scene shows the ballroom, with lots of nobles dancing elegantly together. The Prince sits to one side on his throne and takes little interest until Cinderella arrives. Then he steps onto the floor with her and they dance while the other guests watch. Suddenly a clock appears on the floor and shows that it is midnight, and Cinderella tries to leave, but the Prince detains her. Then a funny gnome-like creature hops out of the clock, holding up another clock-face, and Cinderella tries again to leave, but before she can make it, the fairy godmother appears and causes her dress to become rags again. She flees in humiliation while the nobles laugh, but the prince picks up one of her shoes that has been left behind. The next scene is in her bedroom, and she has a nightmare involving clocks and the gnome, all dancing about to taunt her. Then she is with her sisters again, and they are apparently ordering her to get to work, when the Prince comes in to try the shoe on everyone. Of course, he tries the sisters first, and it won’t fit, then Cinderella, and it does and the fairy godmother restores her dress and the Prince and Cinderella leave together. Now the scene shifts to outside the palace, and a crowd of people gathers to watch the wedding procession as it passes. There are soldiers, peasants, nobles, a priest, and the King and Queen as well as the happy couple. The onlookers give a dance in their honor and they are joined by a ballerina who performs. At the end, the backdrop is lifted to show the Prince, Cinderella, and the rest of the wedding party on their thrones. In the early years of cinema, certain stories were made and remade ad infinitum. This is now the third version of this story to be reviewed on the Century Film Project (the others starred Florence LaBadie and Mary Pickford). It is a somewhat unusual take on the tale, especially since the ball is over before half of the movie’s run time has completed! Actually, a lot of what follows struck me as padding, especially the dance at the end. It seems like more time could have been spent at the beginning establishing Cinderella’s life of drudgery, and less time celebrating her wedding, though the clock nightmare was interesting. I’m not 100% certain whether the surviving copy is complete, either – perhaps there was more of the cruel step-sisters in the original. One interesting thing about the Flicker Alley print is that we get about 30 seconds of hand-painted color at the beginning, which is truly lovely, although it goes away all too quickly. I really wanted to see the ball in color, and the final dance might have been more interesting with it as well. For Méliès, this was a fairly mature production: he uses special effects in showing the magic and telling the story, but they are not the point of the film, and he links the several different scenes well with basic editing. It was probably one of the most expensive movies he had made at the time as well – just in terms of all the sets he had to build alone. For once, we have some reasonably reliable cast information. Jeanne d’Alcy, who played the queen mother, was later to be Méliès’s wife, and has appeared uncredited in a number of his other movies. I agree that more time in the film could have been spent on Cinderella’s miserable pre-ball life, and a little less on the wedding dance, however, this film is still a treat, as you indicated. I also loved the nightmarish clock sequence. Yes, more work may have gone into costumes than sets, in fact. I agree that the “dance of the clocks” is a high point in the movie.